The study, which was commissioned by a private developer “All-Asia Resources and Reclamation Corporation (ARRC)” in the Philippines, covers a new international airport and seaport with supporting traffic infrastructure comprising roads, bridges, an immersed tunnel and a light rail connection. The new airport will substitute the existing NAIA airport, which capacity has been reached. The project includes a new airport for up to 90 million passengers per year. The existing NAIA airport will be replaced by new urban development, covering and area of 2 million m2. The new seaport will secure space for the annually handling of 2 million containers (TEU), oil storage facilities away from the city center, dry bulk and Ro-Ro terminals. 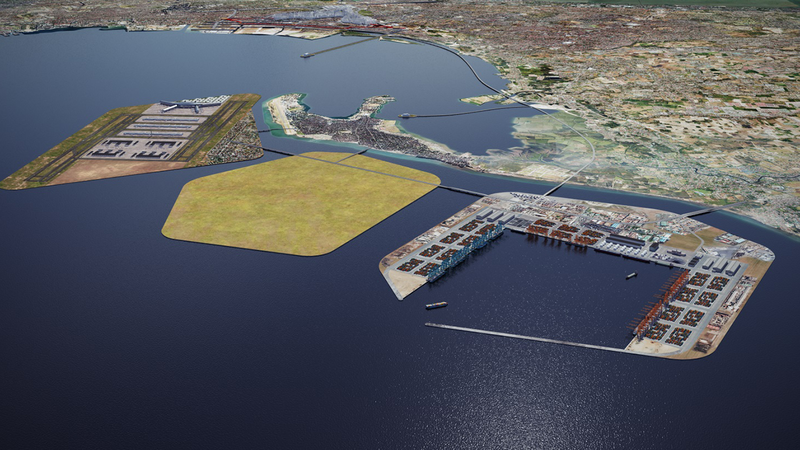 The new seaport – envisaged as a new gateway to Manila - will secure optimum export/import conditions for the future development of nearby Economic and Export Processing Zones, and alleviate the pressure on the existing port terminals in Manila and the congested road network in the centre of Manila. The feasibility study is comprised of stakeholder analyses, market forecasts geotechnical assessments, coastal hydraulic assessments, Initial Environmental Evaluation (IEE), port planning, airport planning, infrastructure planning, urban planning, financial assessments and draft business plans. Impact on the current and wave patterns was studied using MIKE 21 HD and SW models which are state-of-the-art numerical tools for studies and analysis of currents waves in ports and near-shore areas. Furthermore, the modelling resulted in prediction of maximum wave heights during a typhoon scenario. Finally, the modelling resulted in assessments of the impact on the sediment transport in Manila Bay. Forecasts of cargo/vessel traffic and design vessels during the next 25 years were used as basis for master planning and conceptual layout of the seaport and planning of required equipment, facilities and structures. The Master Plan and Conceptual Layout was coordinated with the Obstacle zones (flight zones) in the adjacent airport layout.